Over the years I’ve argued that there is a single, easy to track metric for buyer engagement – Recency. Though you can develop really complex models for purchase likelihood, just knowing “weeks since last purchase” gets you a long way to understanding how to optimize Marketing and Service programs for profit. Which brings me to the latest Marketing Science article I have reviewed for the Web Analytics Association, Dynamic Customer Management and the Value of One-to-One Marketing, where the researchers find “customized promotions yield large increases in revenue and profits relative to uniform promotion policies”. And what variable is most effective when customizing promotions? 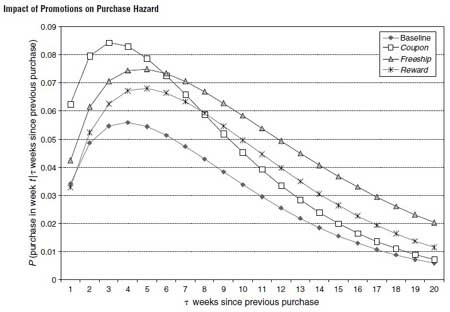 The researchers took 56 weeks of purchase behavior from an online store, and used the first 50 weeks to construct a predictive model of purchase behavior. Inputs to the model included Price, presence of Banner Ads, 3 types of promotions, order sizes, number of orders, merchandise category, demographics, and weeks since last purchase (Recency). 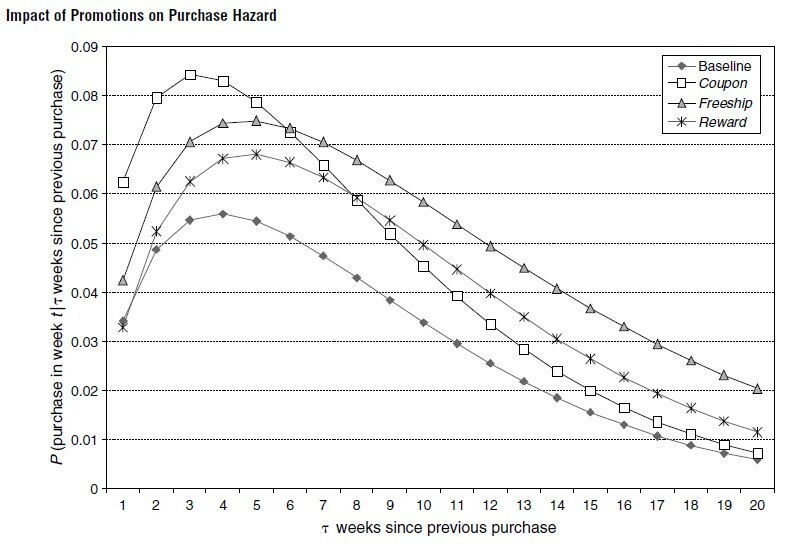 Weeks since last purchase dominated the predictive power of the model, controlling not only the Natural purchase rate (labeled Baseline in chart above, people who received no promotions) but the response to all three different types of promotion.